Behind-the-scenes in Chassis Dynamometer Testing and Tuning (AUT 250). Inside the classroom: The “dyno” class teaches the dynamic application of engine management by using a chassis dynamometer, which measures a car’s performance during maintenance. 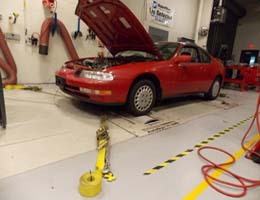 To use the chassis dynamometer, the test vehicle is strapped to the floor with heavy-duty lines and placed on rollers, allowing the car to be “driven” by a computer that is operated by the instructor. The computer allows auto workers to measure performance gains and losses during component and software alterations on vehicles. These measurements allow cars to be optimized for power or efficiency. 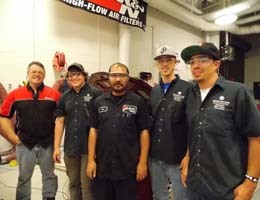 Student voice: “I’d definitely recommend this class to other gear heads like me. We learn how to do ‘dyno’ testing and we can bring in our own vehicles for tuning. It’s about making choices here – you can’t have your cake and eat it too. You have to tune to gain horsepower or fuel efficiency.” — Cody Shuler, a poultry farmer who uses what he learns to fix and maintain the motorized equipment on his 250-acre farm.